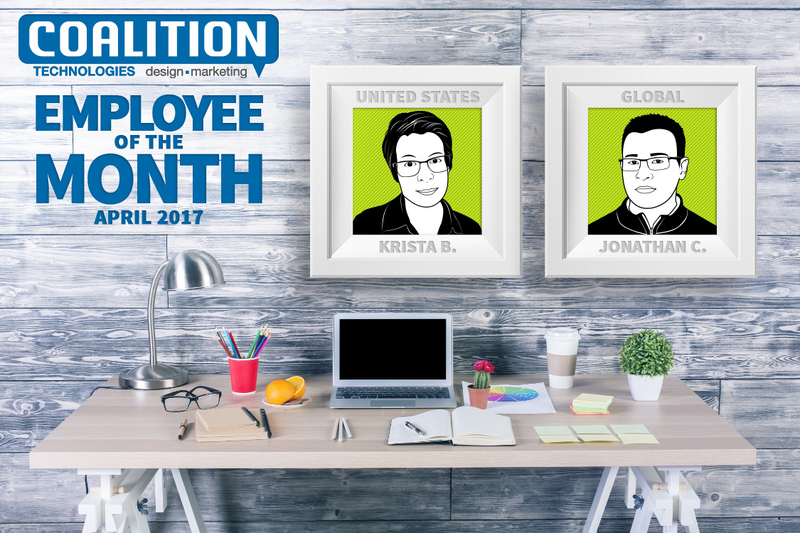 Coalition Technologies is pleased to announce our April Employees of the Month: Krista Bornman and Jonathan Calderon! Both Krista and Jonathan bring so much to our projects and continuously help make our clients’ campaigns successful. Take a closer look at what they do to make Coalition great! Krista started with us in October of 2015 as a Web Digital Producer, and has steadily expanded her expertise into digital marketing. She manages a range of accounts, from web development to support projects to SEO strategies and marketing for our clients. Krista enjoys working with all of her clients, including Southwest Silver Gallery, Lily Sarah Grace, and QSpray. She loves learning about a variety of industries outside of the tech community. She has worked with incredibly niche clients, like custom 3D glasses, and clients in competitive industries like women’s apparel. In order come up with the best strategy for success, she dives deep into their business models, which helps expand her knowledge set and is her favorite part of the job. When she isn’t making the whole office participate in the Mannequin Challenge or hiding Easter eggs around the office (two of which haven’t been found yet), Krista loves exploring Los Angeles’ gigantic selection of eateries—she highly recommends Little Easy in Downtown LA. Jonathan started with us in January of this year as a Front End Developer, and has quickly proven his worth. He works with our web development team to build websites, extend and develop plugins and themes, and strives to produce a high quality of work.. He’s proud of the work he did integrating Experian’s API with our client Cashback Loans. Jonathan’s favorite thing about working with Coalition Technologies is the environment we’ve created. He enjoys all his coworkers and how we all work together to achieve great things. He’s even enjoyed a chess game with his boss after work, describing it as both tough and funny. In his free time, Jonathan enjoys travelling and seeing different cultures and types of food. He also loves to watch movies and read books. 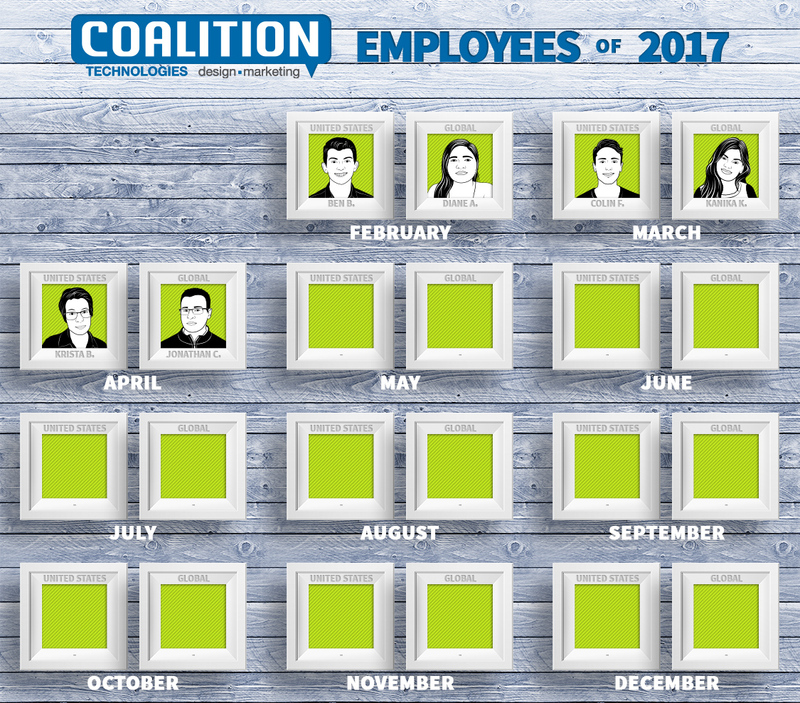 Coalition Technologies is exceptionally proud of all the hard work our employees put in month after month to make our company great. Be sure to check in next month for May’s employees of the month!